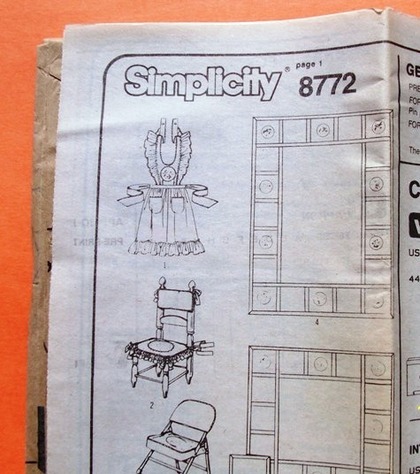 Simplicity 8772. Includes pattern for Bib-style apron, Chair Cushion, folding Chair Cover, Rectangular Tablecloth & set of 4 napkins, Square Tablecloth & set of 2 napkins. Everything you need to dress up your kitchen to suit your own decorating scheme. This is from an estate sale. There is some age discoloration on the instruction sheet. There is no pattern envelope, so no yardage requirements. Packaged in a zip baggie. Price does not include postage.